It's not everyday you get to say you met one of your heros, but I did last week at the store. I have spoken with Mr. Patrick Campbell on the phone. I have spent a day selling his wines with his daughter, Arya, in the Triangle. I have tasted his wines many times and felt like I really knew him, but I never actually shook his hand until last Tuesday. Patrick Campbell is the owner and founder of Laurel Glen winery on Sonoma Mountain. Sure the wines are excellent. I won't even get into that part. Let's just say the wine part is a given. Patrick has played a major role in our wine culture today and most people don't even know his name. Ever so humble and kind, Patrick comes across as quiet and mild mannered. He established the Sonoma Mountain AVA (American Viticultural Area, the US wine appellation system); he fought the government when they proposed a more lengthy and perhaps even more unreasonable sounding alcohol warning on wine bottles. He is greatly responsible for getting it whittled down to the current warning you see today. In fact on his Counterpoint Cabernet bottling he has a statement regarding sulfites being naturally occurring in wine and a part of food for millennia. He is the only person with this statement on a wine bottle and the ATF is just itching to make him take it off. Patrick explained that he has never updated the Counterpoint label because if he makes the slightest change, it will have to go through re-approval and "they" will ban his sulfite statement. Way to give 'em hell Patrick. Patrick describes his winemaking start this way, "I was born in Baltimore in 1947, grew up on the fringes of the southern California wine industry, and studied English Literature at Pomona College and Philosophy of Religion at Harvard University. I have a degree in neither viticulture nor enology. In short, I have the proper credentials for winemaking." Patrick farms his estate organically and started on top of Sonoma Mountain in 1977. He told me the grapes planted there were so incredibly inappropriate, Palomino in fact, but at that time matching vineyards and climate to the proper grape vine wasn't really discussed. He was the first American winemaker to go to Argentina to work with farmers and to bring the wine back home to the US for bottling. Bringing the wine back in bulk tanks as ballast for the ship below the water line ensures a proper temperature half way around the world and makes environmental sense due to the lack of shipping glass and boxes. To this day, he still stands for reasonably priced wine and thinks everyone should be able to drink well in the $10 range. Patrick was also stricken by Polio as a child and walks with assistance. About three minutes after meeting him, you quickly forget, as he can be so engaging and his list of accomplishments include professional ocean kayak racing, concert Violist with several San Francisco Bay area symphonies, and winemaker making it seem like he has done much more than most people without the crutches. He has been a leader in the world of wine on so many issues that he received the first ever, Wine Industry Integrity Award. Today he is wrestling the legal system as an advocate for making wine shipping legal to all states. 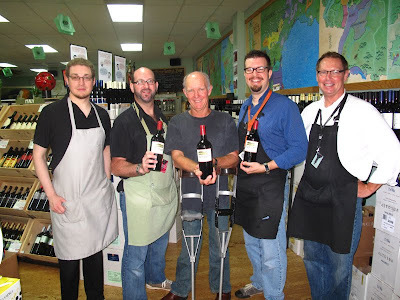 For further reading check out the Press Democrat Article, and his website Laurel Glen Winery.